If we were to live in a society where nobody went off to work and where new parents were well supported in their new role as parents, then the early days for new families would be much different. But this is not the case. While learning how to be a parent, and getting very little sleep, we’re often expected to maintain many other parts of life and often have to do it alone. It can feel like all we need is for our babies to sleep in order to get everything else done. But this puts a lot of pressure on a little baby to sleep, and sleep well. So how do we improve the experience for all involved? Below I’ll give you some tips on how to help your baby find their own natural sleep routine. First and foremost, let’s acknowledge that it's completely normal for babies to have unpredictable sleep patterns. Let’s also acknowledge that this can make life tricky and cause a lot of stress and anxiety. We often want to rush our babies into regular sleep patterns to avoid problems, but in doing so we are at risk of causing them unnecessary distress. In another article I talk about the importance of not imposing rigid routines on babies, because if we put this kind of pressure on our babies it can result in more stress for everyone. Sleep irregularity is normal and an important part of development. So if we agree that we want to support our babies as they develop their own natural patterns, how can we help them in a way that also helps us? The fear mongering about what will happen if your baby doesn’t ‘learn’ to sleep is rife. And with all the talk of baby sleep problems and baby sleep training, what is often not considered is the baby! So let’s talk about the baby! Your baby’s temperament can influence how well they go to sleep. 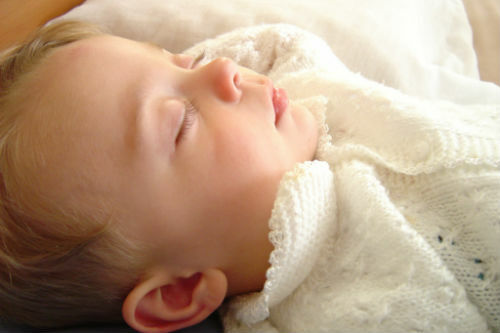 Calm, relaxed babies are often able to snuggle in for sleep more readily than alert, active, stimulated babies. Given the choice, babies would sleep with you, on you and around you for a long time, because they have an inborn drive to stay safe and close to you. A stimulating sleeping environment may be fine when your baby a few months old, but as they become more social and more aware of the world around them, they may struggle to settle when the world around them is active. But this will depend on their temperament as well. Babies become accustomed to what they experience repeatedly, but they also need to feel emotionally and physically comfortable for a healthy routine to emerge. So how does this apply to something like your baby sleeping in their bassinet or cot? They need to do it a number of times, but they also need to feel safe as they experience their cot. So stay nearby in the beginning to comfort them when they need it. It’s okay to feed a baby when hungry. It seems crazy to have to say this, but a strict pattern of feeding may result in feeding a baby when they’re not hungry and trying to get them to go to sleep when not tired. Or trying to get a sleepy baby to sleep when they are hungry! Babies who are distressed are less likely to drift to sleep. They need comfort and support rather than expecting them to be able to manage alone. This is how they will learn that their bassinet or cot is a safe place. Sometimes, even if all of their needs are met (full tummy, clean nappy etc), babies can still have trouble drifting to sleep because they’re not emotionally in the right space. If you’re struggling to get your baby off to sleep and you don’t know what else to do, it’s highly likely they probably just need more cuddles. Another common feature of sleep ‘training regimes’ is the idea that babies should be able to resettle themselves when they’re crying in their bassinet or cot. But this ability to resettle only develops over time, and a baby needs to know that they’re safe before learning that it’s ok to wake up alone and then be able to drift back off to sleep. So in the meantime, give them some comforting and cuddles as needed! (Also find out why babies cry). Some babies are really hard to get to sleep. Other babies may easily go to sleep but wake up soon after. It can be confusing for parents to know what to do. The best thing to do is try and stay calm, which I know is easier said than done. But it can be a recipe for disaster if we pin too many hopes on a baby going to sleep and staying asleep. Try to remember that it’s normal for a baby find sleep difficult if they’re unsettled, uncomfortable or distressed. If you can accept this reality, then you’ll be calmer and more likely to settle your baby so you can get back to doing something else (like showering or eating). The best way to help your baby find sleep is to be flexible and prepared to support them as they learn the art of drifting to sleep unaided. Be mindful to watch when they are calm, then pop them back in their bassinet or cot, and watch to see if they need you again. This way they can show you when they need you rather than you ‘putting’ them to sleep every time. If you want to talk about sleep patterns, or anything else you might be struggling with, our baby consultants are available to help talk it through. Helen’s books also have great tips on how to get your baby to sleep, and what a normal pattern might look like to babies at different stages.